The full set of the historical 2004 and 2005 “New Orleans Conferences.” One of the highest quality set of DVDs yet produced in our movement. 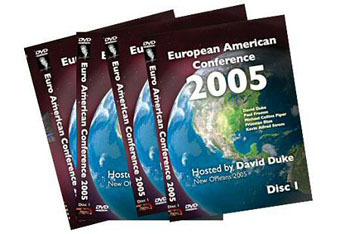 €19.95 Euro Price marked down to €59.95 The full set of the historical 2004 and 2005 “New Orleans Conferences.” One of the highest quality set of DVDs yet produced in our movement. If you are one of the 400+ patriots who were there and whose cheering can be heard you’ll want these DVDs to relive the experience. If you are one of the thousands we wish could have been there, these DVDs are as close to having been there as you can get. €19.95 Euro Price -Marked down from €59.95.